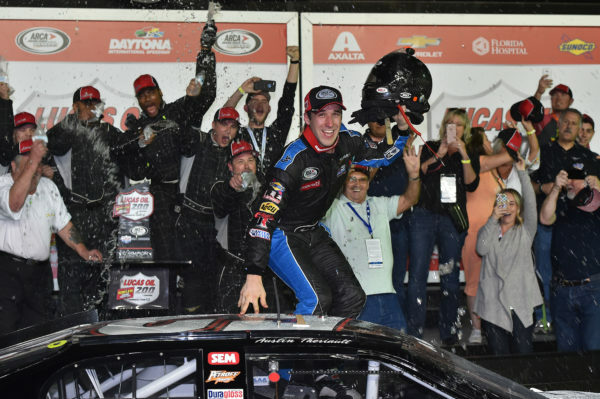 ARCA Series driver Austin Theriault (52) celebrates winning the Lucas Oil Complete Engine Treatment 200 at Daytona International Speedway. Fort Kent’s Austin Theriault padded his lead atop the ARCA Racing points standings with a third-place finish at the ARCA 200 at Winchester Speedway in Indiana on Sunday. His closest challenger, Dalton Sargeant, finished 16th after cutting a tire and hitting the wall in turn one. Kyle Benjamin, who set the course record in winning the pole over the half-mile oval, won the race with Christian Eckes finishing second. Theriault expanded his lead to 175 points over Sargeant. He gained 65 points on Sunday. Theriault now has 3,305 points through 13 of 20 races while Sargeant has 3130. Theriault, who was driving the No. 52 Ken Schrader Racing Ford, said on the ARCA Racing website that he was satisfied with the showing. “When we struggle like we did today and overcome it, it teaches us a lot,” said Theriault. “We started the race way too free but, at the same time, the car wasn’t turning well either. You can’t adjust for both so we went the route to where I could at least drive it and it tightened up. “Good day all things considered,” said Theriault. He now has 10 top-five finishes in 13 races including three wins. He has been in the top 10 in all 13 races. Theriault will return to action on Aug. 20 for the Herr’s Potato Chips 100 at the Illinois State Fairgrounds.